Consultation on Working Draft Environmental Statement. This has now closed. Here is the Appleby Environment submission HS2 DES. The following 6 maps have been extracted from HS2’s draft environmental statement as the most relevant for residents responding to the consultation. They are HS2’s assessment of the impact of the line on your environment. The next two maps are the landscaping and planting they intend to leave. Again one for Appleby Parva Landscaping and planting AP (HS2 DES 2018) and the other for Appleby Magna Landscaping and planting AM (HS2 DES 2018). Reminder the deadline is 11.45 pm on 21st December 2018. At the Measham Event, HS2 staff seemed willing to listen to concerns. They said that the current plans were not absolutely fixed and a strong response over issues like the fate of the Old Rectory might have a positive outcome. But speaking to them is not a formal response. The consultation where you can make your response is called the Draft Environmental Statement. You can find this via this link . The deadline is 11.45 pm on 21st December 2018. You can respond online or by email. The District Council are providing support and coordination to Parish Councils and action groups. So let Appleby Parish Council know your view by the leaflet you should have had delivered to you or you can download a copy below. The deadline for that is 12th November. Appleby Environment will make their own response. Let us know if you can offer any help. As a result of the changes to Rectory Lane HS2 are saying there will be a loss of access to the allotments for 18 months. This would not be necessary if Tamworth Rd was diverted on the route shown on the leaflet distributed by the Parish Council. Don’t forget to complete the questionnaire and help the Parish Council represent your views. 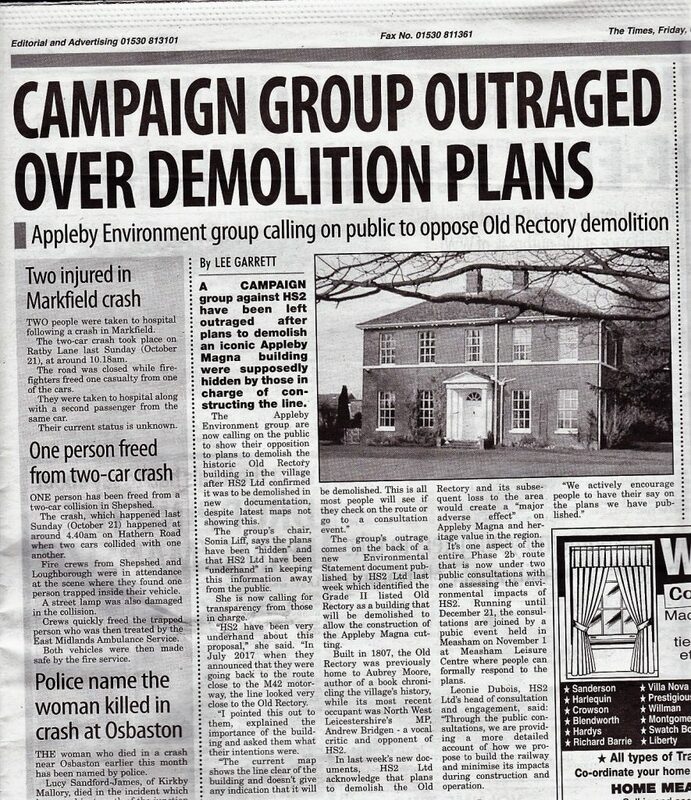 Always read the Small Print – HS2 Plan to demolish the Old Rectory! The issues covered in the leaflet described below were based on the map and information given at the event earlier this year (July 2018). When the Environmental Statement was issued (October 11th) we found that the diversion of Tamworth Rd was less extreme – which is good news. However hidden in the small print we find that HS2 plan to demolish the Old Rectory, a listed building with significance for the social history of Appleby. Descendants of Sir John Moore (who created the school at Appleby) lived there – the last being Aubrey Moore who wrote ‘A Son of the Rectory’, an account of Appleby around 1900. The line will NOT go through it – it just seems that it will be more convenient for HS2 to demolish it when they are constructing the line. HS2’s own assessment is that the loss of the Old Rectory and its associated Coach House will lead to a “major adverse effect”. We feel that this is completely unacceptable and have issued a press release that you can download here Press release old rectory. We suspect that there may be other issues lurking in the small print so please check back to this page. And go to the HS2 Information Event on 1st November at Measham Leisure Centre 2-8 pm, ask questions and let them know your concerns. Appleby Environment has worked with the Parish Council to consult residents on HS2’s proposed route changes and other environmental issues. You should receive one through your door but you can also download it here hs2-questions-003 as distributed. Please do respond so that the Parish Council can take account of your views. You may have also heard about a proposed ‘Route 4’ which would see HS2 go across the M42 after junction 11 and go the Oakthorpe side of the A42 past Measham before returning to the existing route. We understand that this is currently being considered by the Department of Transport and they have sought the view of Measham and Oakthorpe parish councils (but not Appleby!). It is not part of the forthcoming consultation from HS2. However, if the D of T is in favour of this route, HS2 will work up the route and we would then expect another round of public consultation on whether it should be adopted (and this may well affect the road proposals that are currently under consideration …). The formal consultation on the details of the road and footpath changes shown on the new map is expected to open at the end of September and be open for 8 – 10 weeks (so over before Christmas). It is hoped that by then there will be more information on heights / depths but probably not on the design of bridges or other features. An HS2 engineer said the Tamworth Rd re-route had to come the Appleby side of HS2. We are not convinced by this argument – although an alternative would turn Rectory Lane into a dead end. Would this be better or worse than having the main road much closer to the village? The plan is to close the footpath which goes from Appleby across the Tamworth Rd and then on to Stretton. The proposed alternative is very close to the motorway junction and doesn’t have any connection to the current village footpath network. They are also planning to close Dingle Lane bridleway / footpath just at the HS2 crossing. This currently goes from the Appleby Inn to No Man’s Heath and links up to the historic Salt Street path. HS2 say they can’t get the footpath to cross both HS2 and the M42 – again we are not convinced. We also asked how long the building compound would be there … weeks? months?? years??? and the answer was probably several years! HS2 have recently (4/6/2018) published some more details about the route past Appleby. You can download their plans for the Appleby to Ashby stretch here. HS2 will be available to discuss these plans and their implications at meetings over the summer. The nearest one is being held in the Measham Leisure Centre on 12th July 2018 from 2-8 p.m. In a leaflet recently sent to residents they say that these plans are work in progress which may change as a result of ‘further feedback’. the proposed realignments of both the A444 and the road to Measham (Tamworth Rd). Both of these (but particularly the proposal for the Tamworth Rd) bring these main roads closer to the village. Will this increase traffic noise in the village? Will it make it more likely that we will see further housing applications undermining the separation of the village from the road network? The route for HS2 suggests it can miss both the hotel and the Old Rectory (the latter only by a steep embankment side). What will the visual impact be on the classic view of the Old Rectory from the A444? Some footpaths are to be permanently closed and some of the re-routing takes them closer to the motorway junction reducing their appeal as a countryside walk. There will be one main and two smaller construction compounds close to the motorway island. The main one is said to include accommodation … How long will these be in operation? Will they be restored to countryside on completion? Unlike the July maps there are no depth / height indicators on this map. Difficult to assess the visual and noise impact on the village on the two road crossings. There are two stretches where HS2 is above ground, the first where it goes past Appleby Parva and then just before it crosses the (current location of) A444. We need design details for these to assess impact. What are the plans for planting or other forms of environmental enhancement? Or for noise reduction? Do any of these plans increase the likelihood of further unwelcome development at the motorway junction where we know land is being acquired? Please let us have any thoughts and check back regularly. In the Autumn HS2 will open consultation on an environmental statement. The Government announced (17/7/2017) that they were withdrawing the proposed ‘Measham re-route’ and returning to a slightly amended version of the previous route close to the M42 / A42. This can be seen below. The full map (with height / depth of the line relative to ground level) can be downloaded here. 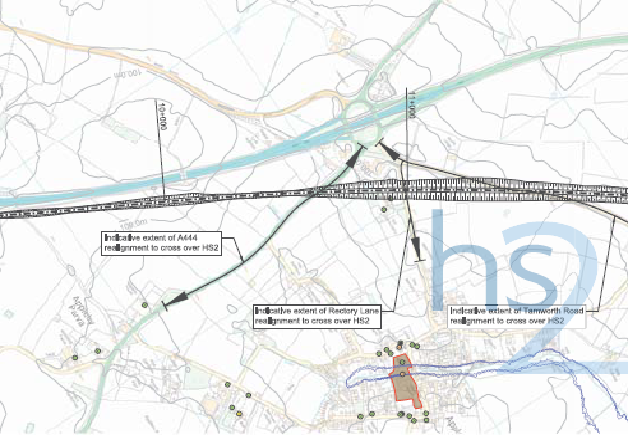 Full maps including the safeguarding and property compensation bands can be found via the HS2 website or on the Mapa (Measham, Appleby, Packington & Austrey) HS2 action website. 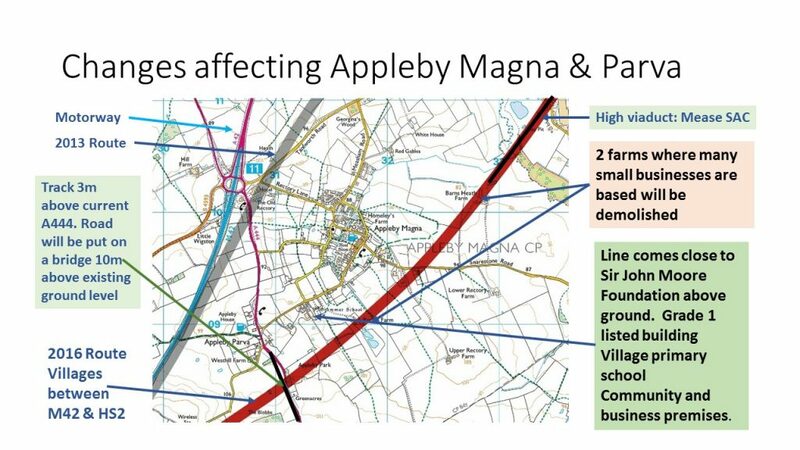 The withdrawn route would have trapped Appleby Magna & Parva between the motorway and the HS2 line, have run close behind the Grade 1 Sir John Moore Foundation building and close to the Conservation Area, and would have destroyed many businesses and jobs at nearby farms and farm-based business parks. You can download MapaHS2action-route-submission against this route. We would rather HS2 was not happening at all and know that its construction and operation will be disrupting and damaging without doing anything to improve our transport options. There will be opportunities to make an input to the detailed design. This is important as the current route seems to run very close (over?) the listed Old Rectory and there is no design yet for the crossings of the A444, Tamworth Rd and Rectory Lane. There may also be opportunities for mitigation (such as sound barriers). Please continue to visit this page for updates on developments and on actions you can take. If you are concerned about this issue please sign up to receive updates from the local action group Measham, Appleby, Packington & Austrey HS2 Action at www.mapahs2action.org.uk/ This will ensure you have the latest information and will help to demonstrate the opposition to this proposal. On 15th November 2016 the Government announced a new route for this leg of HS2. This involves a diversion around Measham with knock on effects for Appleby and other villages. It is NOT the route we were originally consulted on (see our original page below). Instead they have decided it should go the other side of Appleby (across Snarestone Rd close to Jubilee Farm and behind the School) as shown in the map below (the official map can be accessed here – large file). This is closer to the village than the previous route and much closer to the historic parts including the Sir John Moore school. The village will be sandwiched between the motorway one side and the rail line the other. We have opposed HS2 from the start. It brings no transport benefits to local people. It will bring us no closer to a main line station or improve our public transport options in any way. This newly chosen route was rejected by the professional assessors. Local people were never asked their views on it. The Government are holding another consultation on what they describe as ‘route refinements’. This will run until 9th March 2017. The consultation document says ‘The secretary of state is minded to move the route so that it runs to the east of Measham, away from the M42’ and asks whether you support this proposal. We hope to provide more information on arguments you might like to include – and if you have ideas and can help publicise the issues please get in touch. A new action group MAPA (Measham, Appleby, Polesworth, Austrey) was formed after a large (over 350) public meeting in Measham on 13th December. You can download the introductory presentation here. MAPA now has its own website. where you will be able to register as a supporter. The Facebook page has been renamed and can be accessed here. The next meeting is 4th January 2017 at 7pm in the Measham Leisure Centre. Appleby Environment will work with this group. HS2 will be holding an ‘information event’ on 18th January 2017 at the Appleby Park Hotel (at the junction) from 12pm to 8pm for all those affected by what they call the ‘route around Measham’. They say that “due to space restrictions, sound demonstrations will not be available at this event.”! Appleby Magna Parish Council are holding an Open Public Meeting on 19th January 2017 in the Hall at the Sir John Moore School from 7pm. In the meantime you might want to tell local politicians and representatives what you think and ask for their views and support. Contact our MP Andrew Bridgen (andrew.bridgen.mp@parliament.uk). He has been trying to get the original route changed for at least a year without ever discussing it with the people these changes would affect. You could also contact our County Councillor Heather Worman (heather.worman@leics.gov.uk) our District Councillor Richard Blunt (richard.blunt@nwleicestershire.gov.uk) and our Parish Council Chair Paul Hemmerdinger (paulhemmerdinger@gmail.com) and Clerk (lindsaygene@btinternet.com). Below is the original page with the route that was subject to consultation – it describes the situation as it was in 2013 / 14. The Government’s preferred route for the Eastern leg of HS2 (the proposed high speed train link between Birmingham and Leeds) currently passes on the Appleby side of the M42. Roads around the village will be diverted and there is intended to be an elevated section past Appleby Parva. A map of the local part of the route can be downloaded from here. The relevant section is labelled HLS06 (Birchmoor to Tonge) Sheet 2. The route goes right through NW Leicestershire but there is no station planned until Toton – between Nottingham and Derby. Both NW Leicestershire District Council and Leicestershire County Council oppose this route. Opposition groups affiliated to the Stop HS2 campaign are being formed along the route. The HS2 Action Alliance site also contains lots of research and coordinates the case and legal action against HS2. They are currently featuring a video on the problems HS2 will cause for Leicestershire. The Consultation for Phase Two of HS2 closes on Friday, 31st January 2014 at 5pm. If you would like to have your say on the proposed route, please see above on ways to respond.